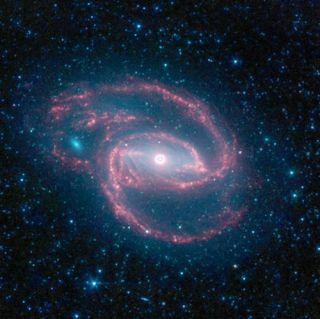 In the Spitzer image of NGC 1097, infrared light with shorter wavelengths is blue, while longer-wavelength light is red. A coiledgalaxy with an eye-like object at its center harbors a hidden black holesurrounded by a storm of star formation. The galaxy,called NGC 1097, is located 50 million light-years from Earth. It isspiral-shaped like our own Milky Way, with long, spindly arms of stars. The"eye" at the center of the galaxy is caused by a monstrous black hole,which can't be seen but is surrounded by a ring of stars and rampant star birth.In a new color-coded infrared view from NASA's Spitzer Space Telescope, thearea around the invisible black hole is blue and the ring of stars, white. Black holescan't be seen because matter and light gets trapped in them. But they areidentifiable by the gravitational interaction with their surroundings and thechaotic activity that goes on there. The blackhole is huge, about 100 million times the mass of our sun, and is feeding offgas and dust along with the occasional unlucky star. Our Milky Way's centralblack hole is tame in comparison, with a measly mass of just a few millionsuns. "Thefate of this black hole and others like it is an active area of research,"said George Helou, deputy director of NASA's Spitzer Science Center at the California Institute of Technology in Pasadena. "Some theories hold that theblack hole might quiet down and eventually enter a more dormant state like ourMilky Way black hole." The ringaround the black hole is bursting with newstar formation. An inflow of material toward the central bar of the galaxyis causing the ring to light up with new stars. "Thering itself is a fascinating object worthy of study because it is forming starsat a very high rate," said Kartik Sheth, an astronomer at NASA's Spitzer Science Center. Thegalaxy's red spiral arms and the swirling spokes seen between the arms showdust heated by newborn stars. Older populations of stars scattered through thegalaxy are blue. The fuzzy blue dot to the left, which appears to fit snugglybetween the arms, is a companion galaxy. "Thecompanion galaxy that looks as if it's playing peek-a-boo through the largergalaxy could have plunged through, poking a hole," Helou said. "Butwe don't know this for sure. It could also just happen to be aligned with a gapin the arms." This imagewas taken during Spitzer's "cold mission," which lasted more thanfive-and-a-half years. The telescope ran out of coolant needed to chill itsinfrared instruments on May 15, 2009. Two of its infrared channels will stillwork perfectly during the new"warm mission," which is expected to begin in a week or so, oncethe observatory has been recalibrated and warms to its new temperature ofaround 30 Kelvin (about minus 406 degrees Fahrenheit).